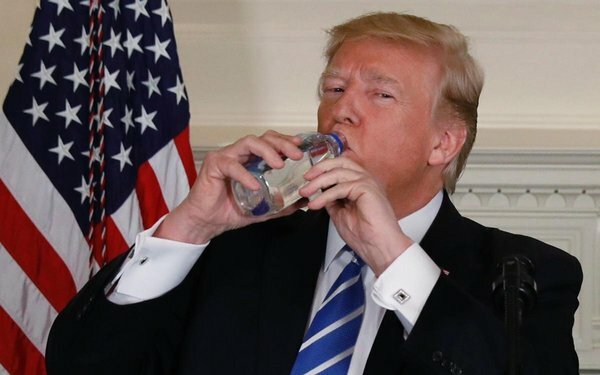 Fiji Water had its day in the sun after President Donald Trump awkwardly took a sip from the four-cornered bottle during a press conference touting his accomplishments during his Asia tour. Twitter lit up with references pro and con to the sip heard ’round the world. “Remember that time @realDonaldTrump complained about international trade but took a long, refreshing swig of imported @FijiWater? Not judging, just saying” TKincaid tweeted. “Welcome to 2017, folks, where taking 10 seconds to grab a drink of water is considered more newsworthy than resolving differences with nations to prevent nuclear war. #Fijiwater #Fijiwatergate,” tweeted MatWood27. Viewers were reminded of the time Trump ridiculed Florida Sen. Marco Rubio during the Republican debates for needed water as he spoke. A fan of the Los Angeles-based company updated its Wikipedia page to include the unexpected endorsement, and it was later deleted. 1 comment about "Trump Bump: Fiji Water's Turn In The Sun". Philip Rosenstein from Law360, November 16, 2017 at 11:38 a.m.